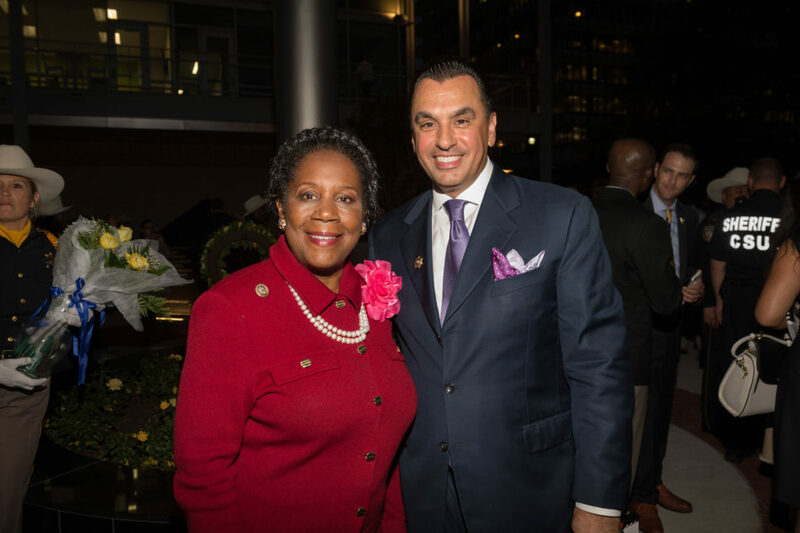 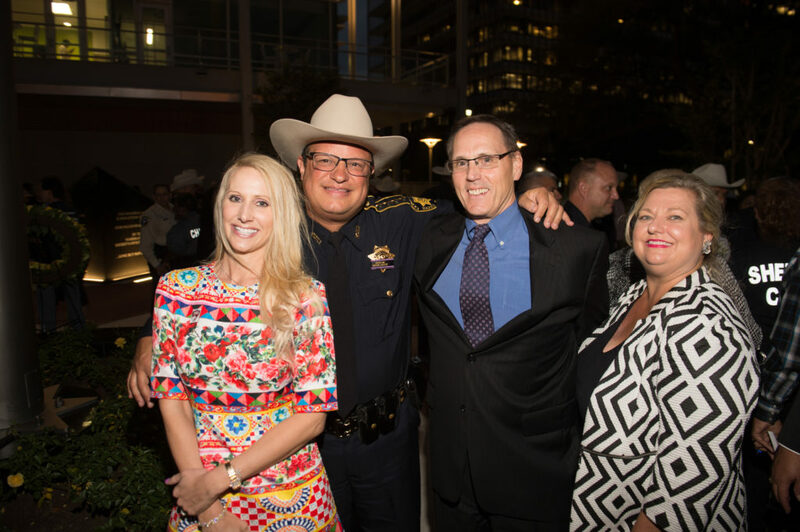 Sharing the vision with former Sheriff Adrian Garcia, the HCSO Foundation agreed to fully fund the design and construction of a Memorial that would properly and respectfully honor the fallen deputies of the HCSO and Peace Officers of Harris County. 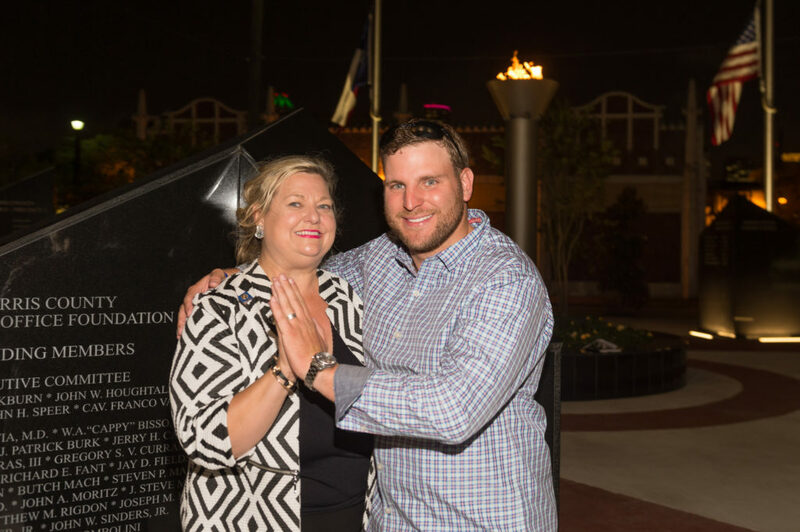 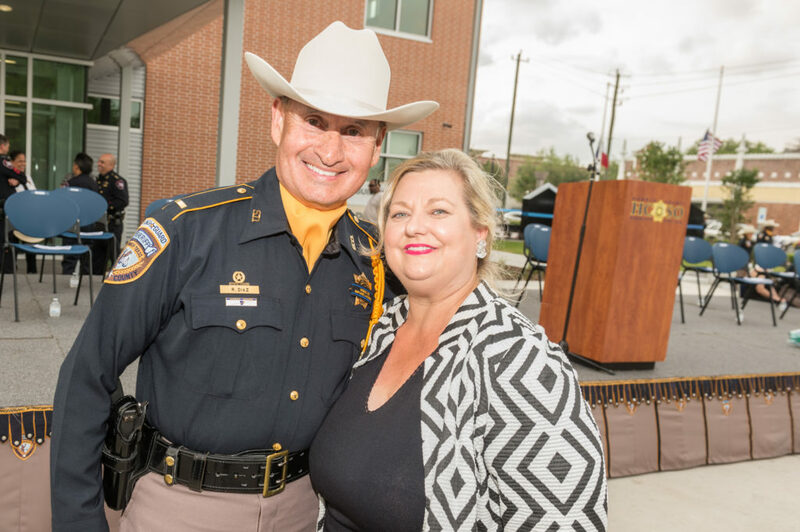 The long-awaited vision to construct a memorial was realized on May 10, 2017 upon the completion and formal dedication by the HCSO Foundation during the Harris County Sheriff’s Office Annual Memorial Service. 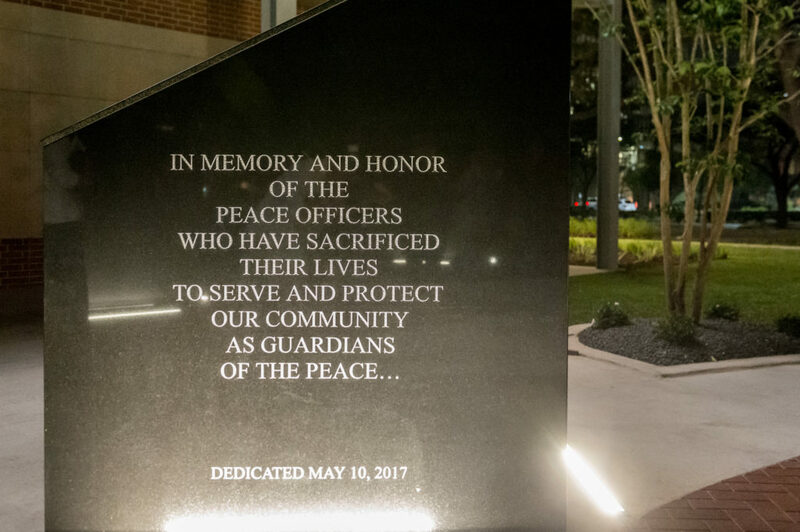 This memorial now stands as a living tribute to the deputies who have made the ultimate sacrifice of life while in the line of duty. 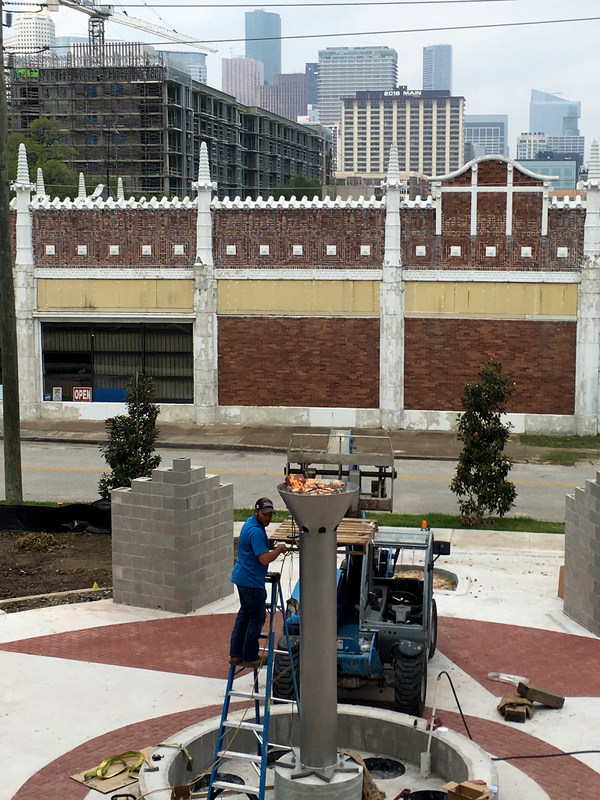 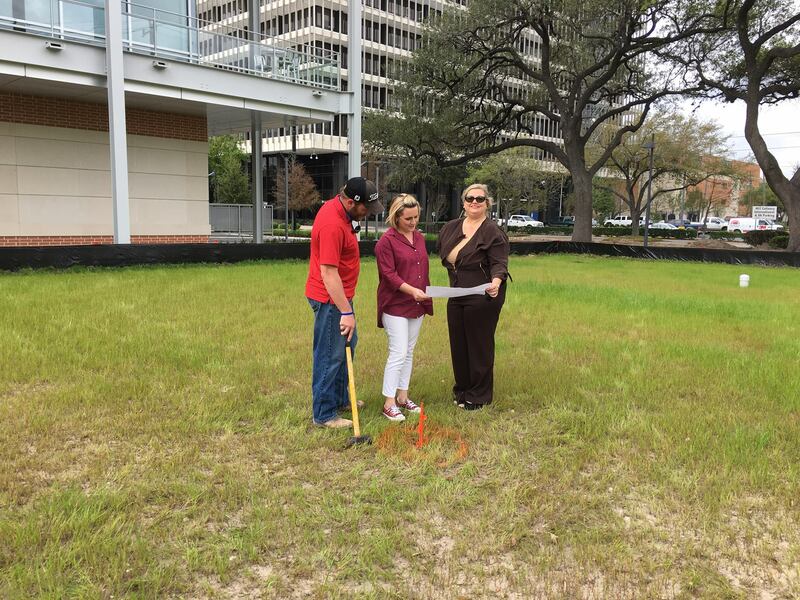 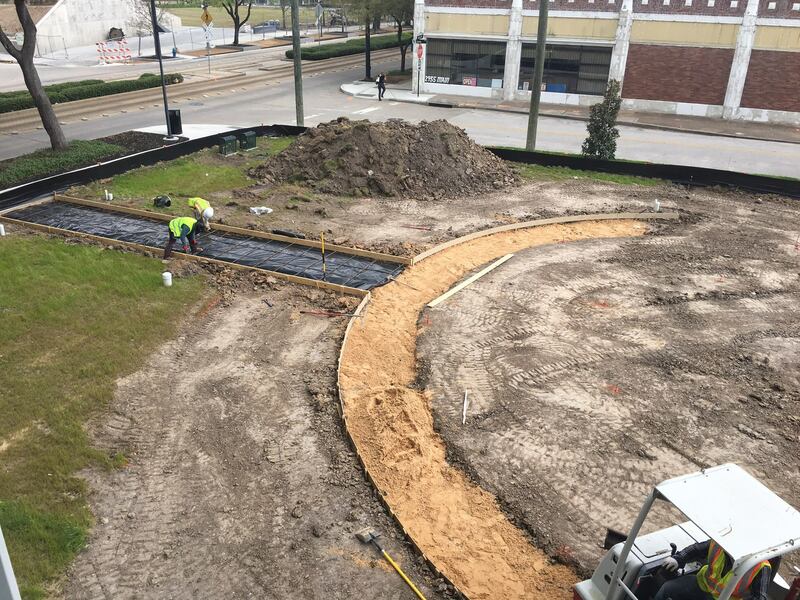 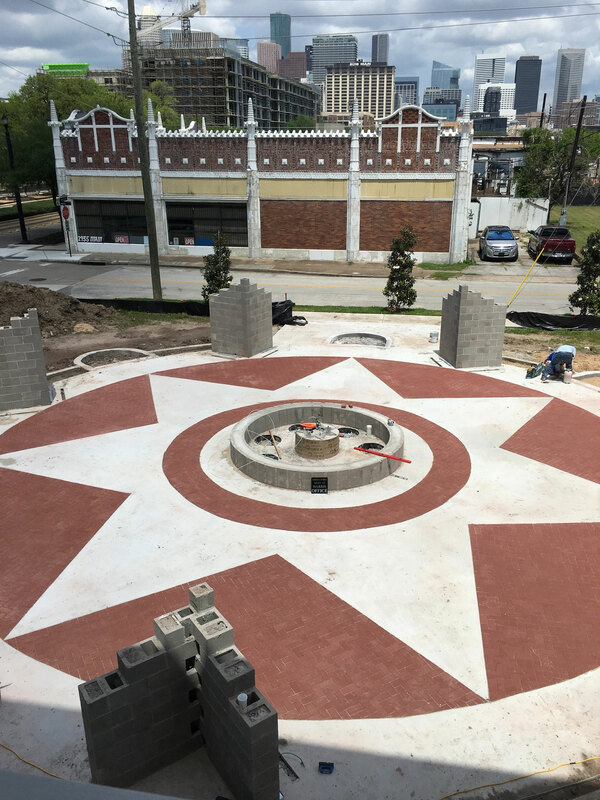 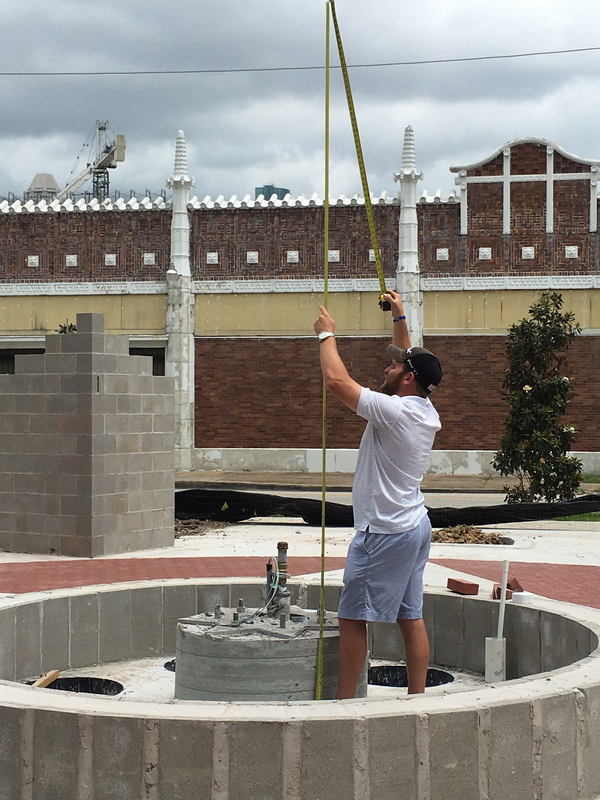 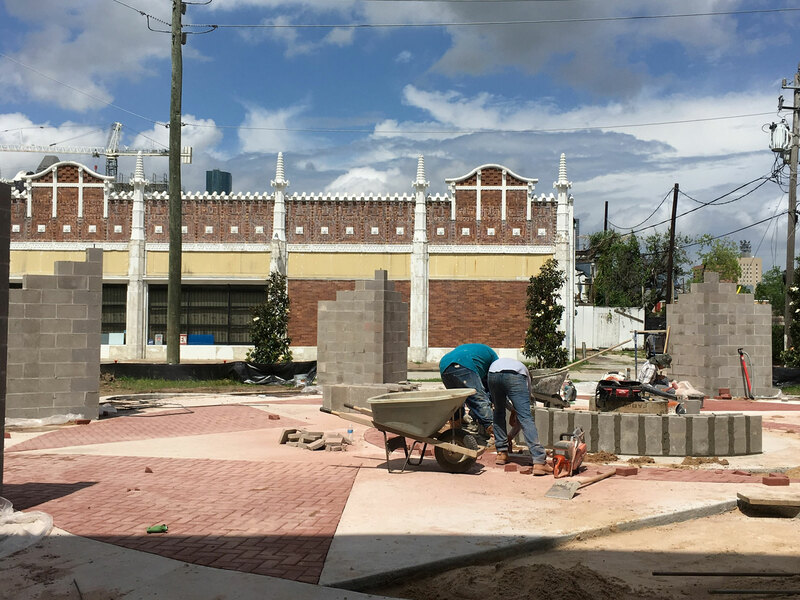 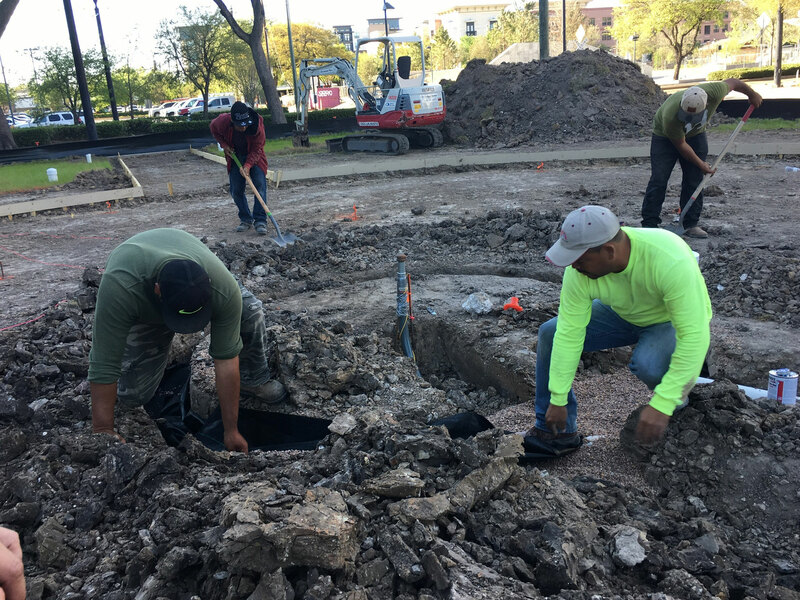 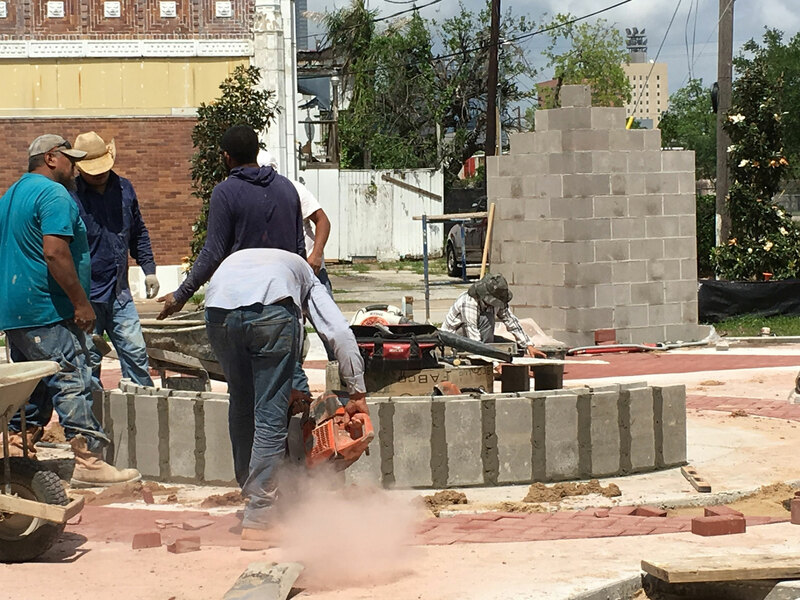 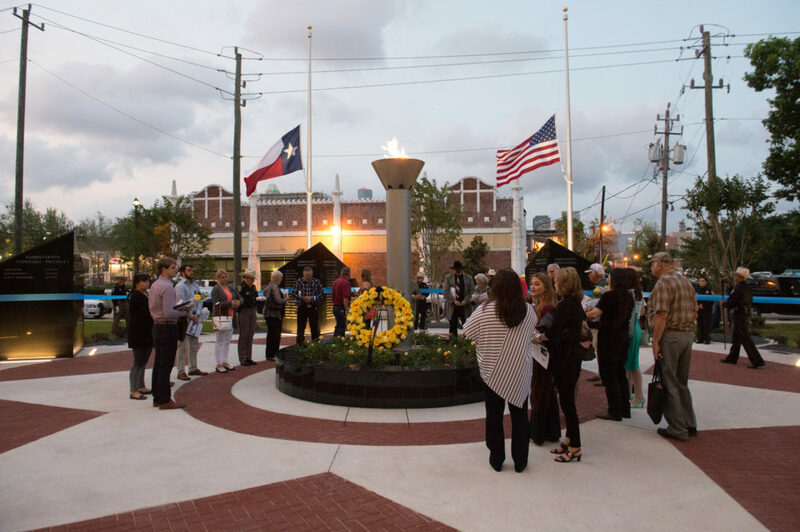 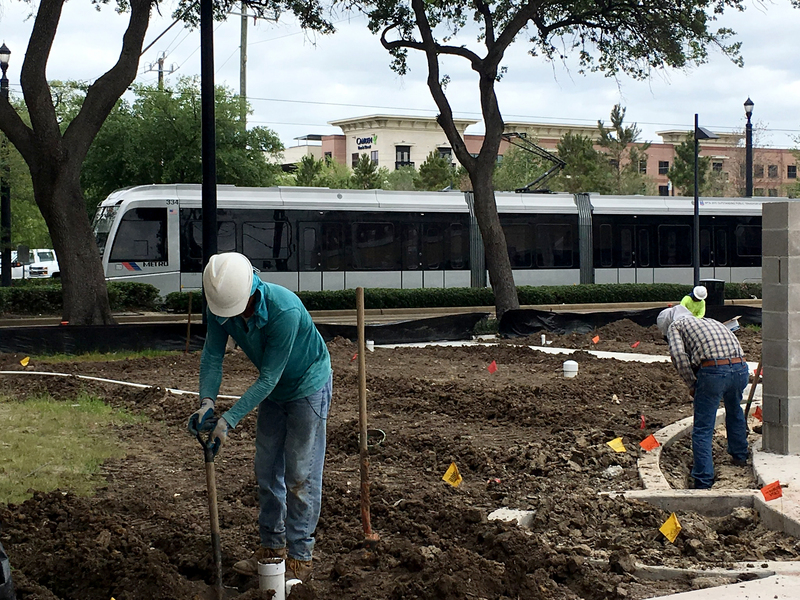 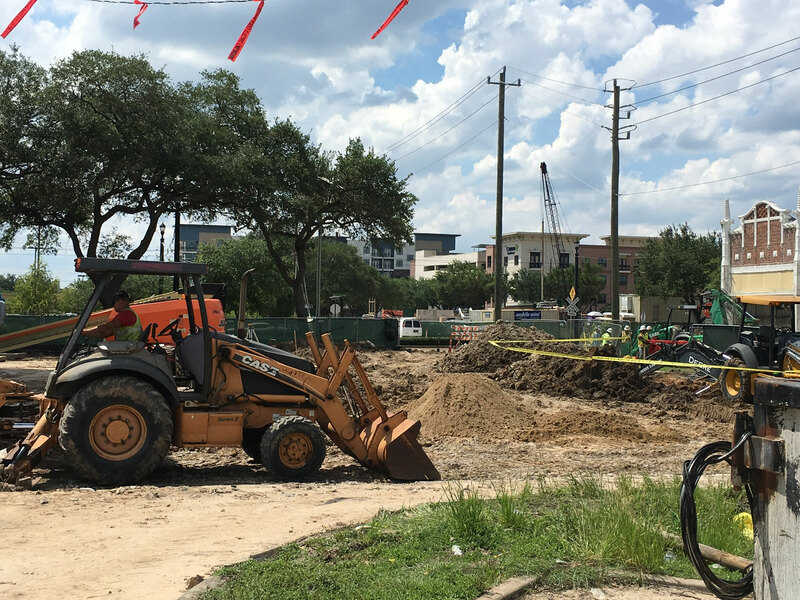 Located at 3001 Main Street, the HCSO Memorial Garden is constructed immediately adjacent to the Crime Stoppers of Houston Dave Ward building. 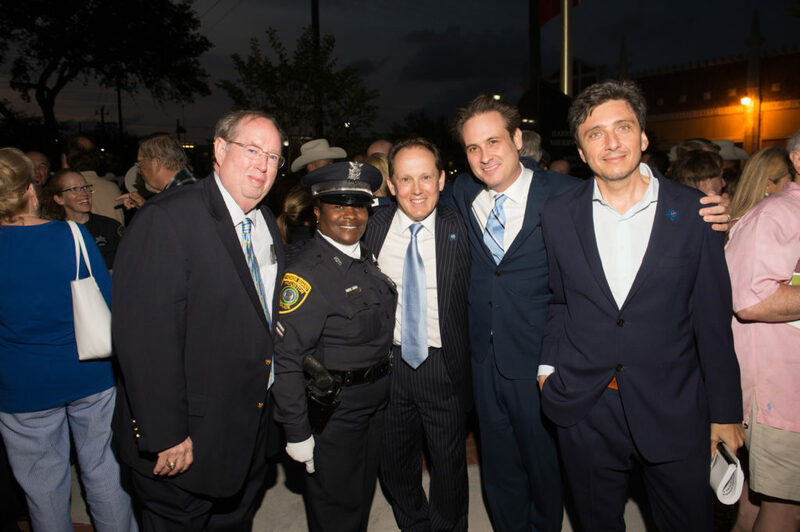 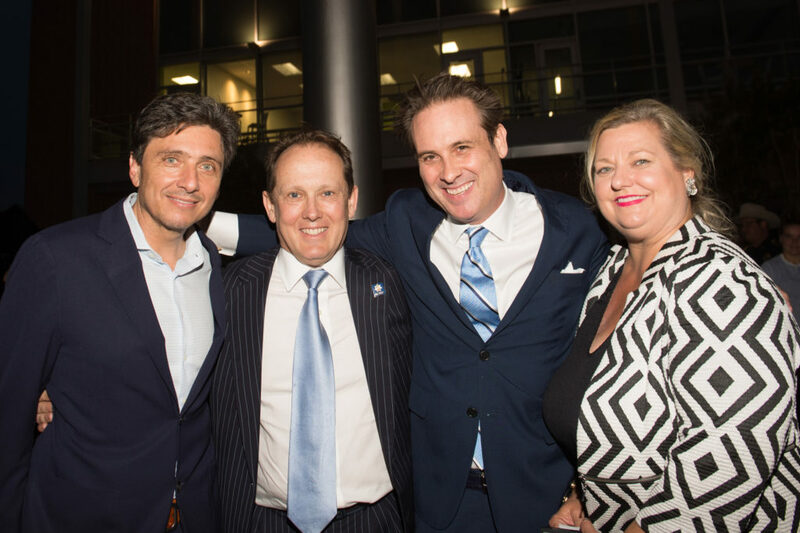 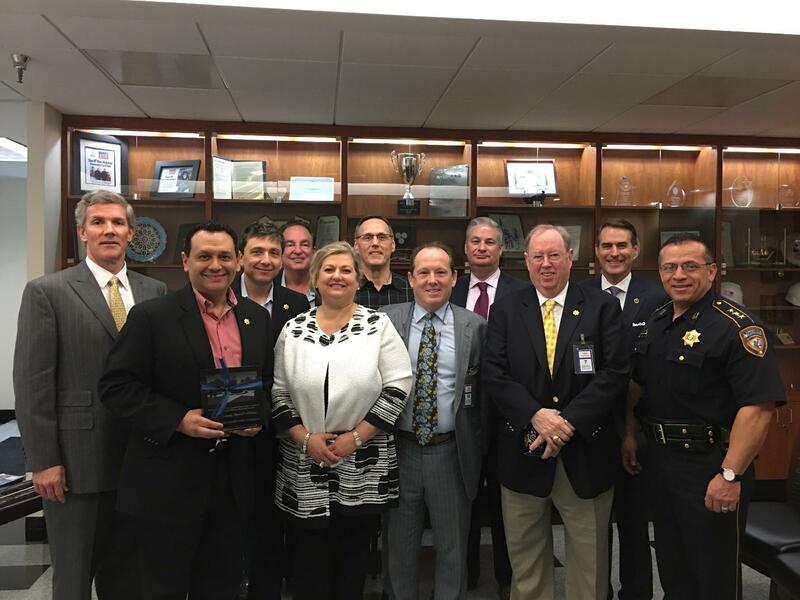 It is an integral part of the Crime Stoppers Safety Block in midtown Houston. 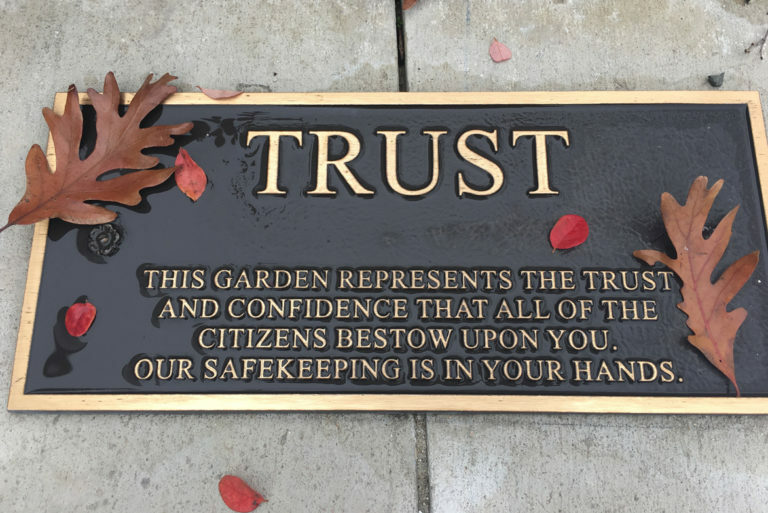 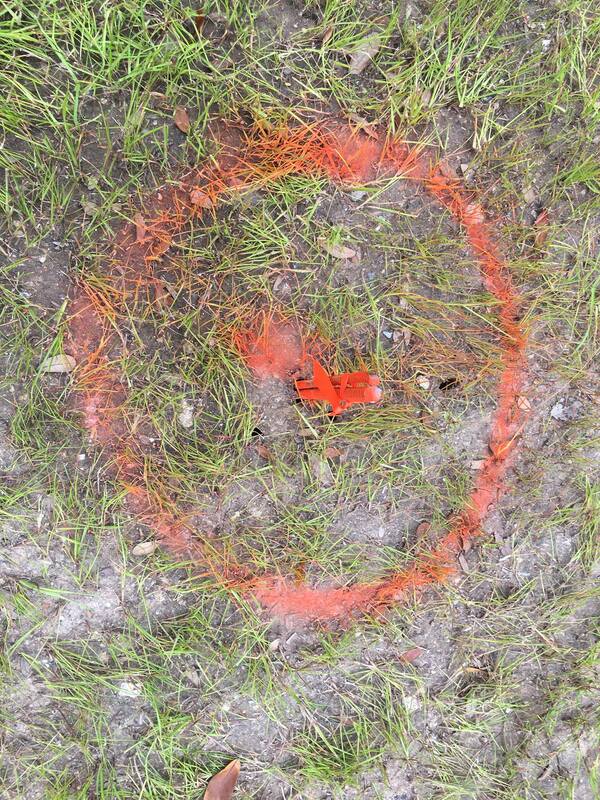 The Memorial Garden may be accessed via entry to the Crime Stoppers visitors parking lot gate from 6:00am to 7:30pm every Monday through Friday, and 9:00am to 6:00pm on Saturday and Sunday. 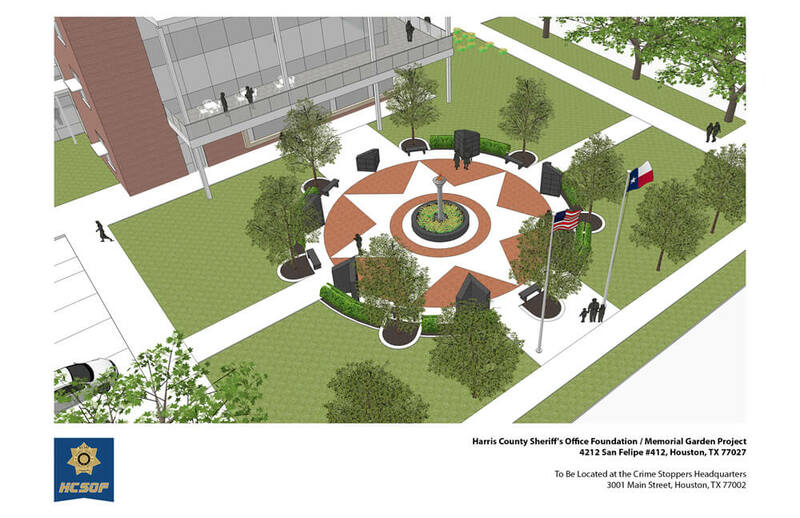 The conceptual design of the HCSO Memorial Garden was created by the Harris County Sheriff’s Office Foundation. 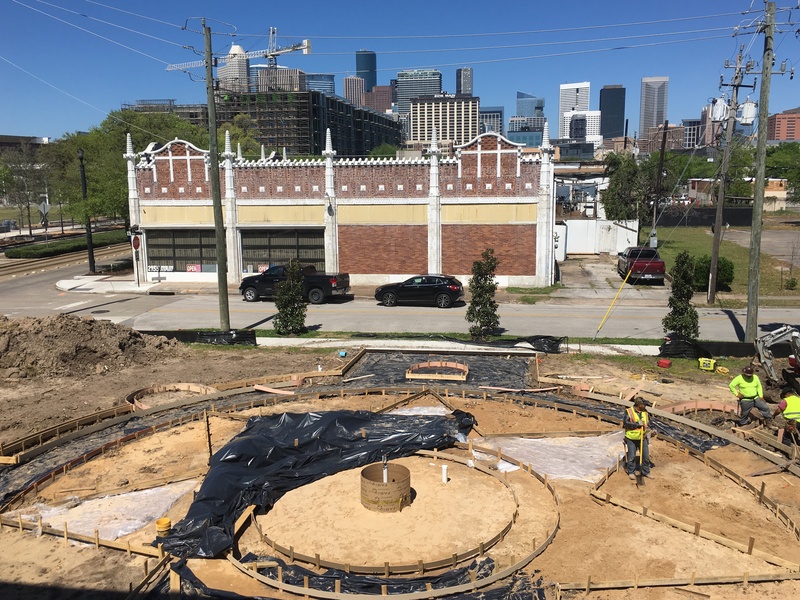 The construction drawings were finalized by Webb Architects of Houston Texas. 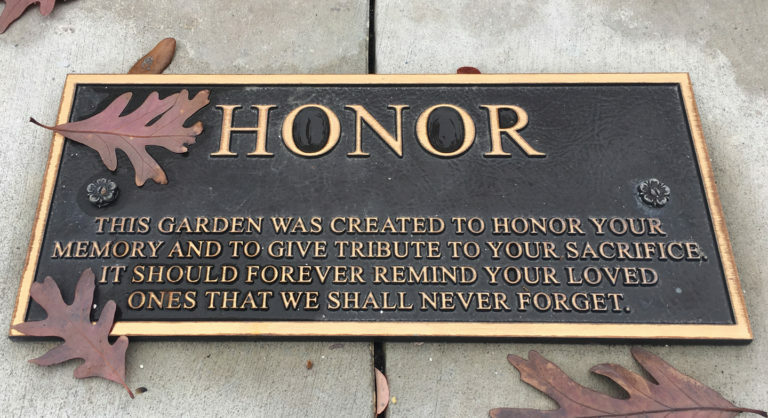 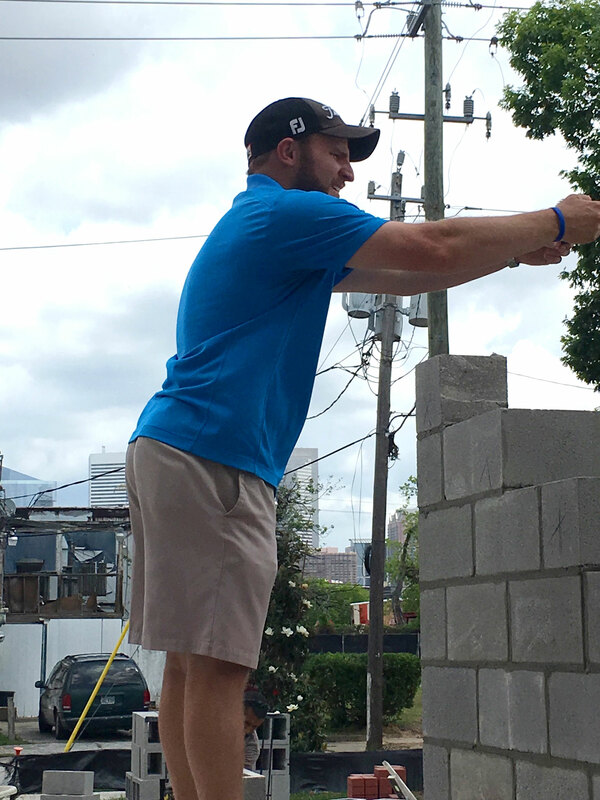 Members of the Memorial Garden’s Design and Construction Project Management Team included: Tracy Krohn, John Speer, Franco Valobra, Larry Blackburn, Katrina Arnim, Jeff Glover, Chris Peters, and Joe Webb, AIA, Principal Webb Architects. 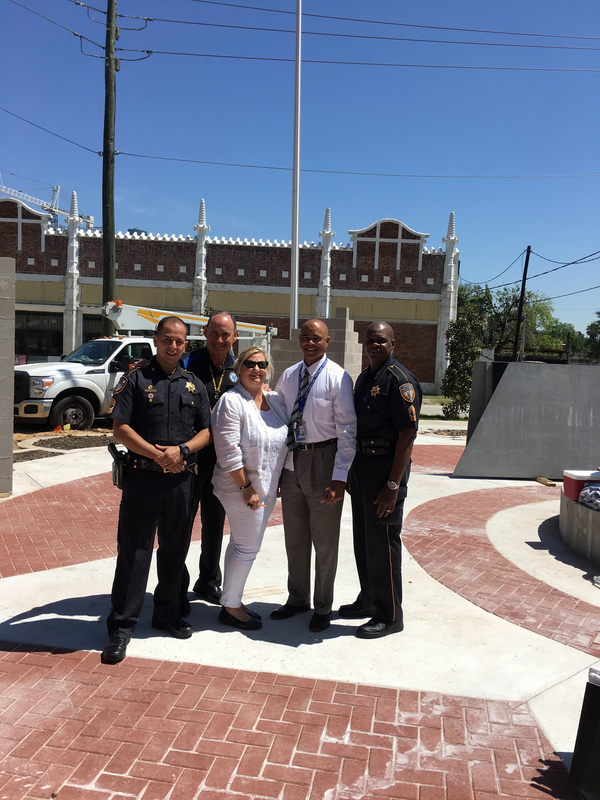 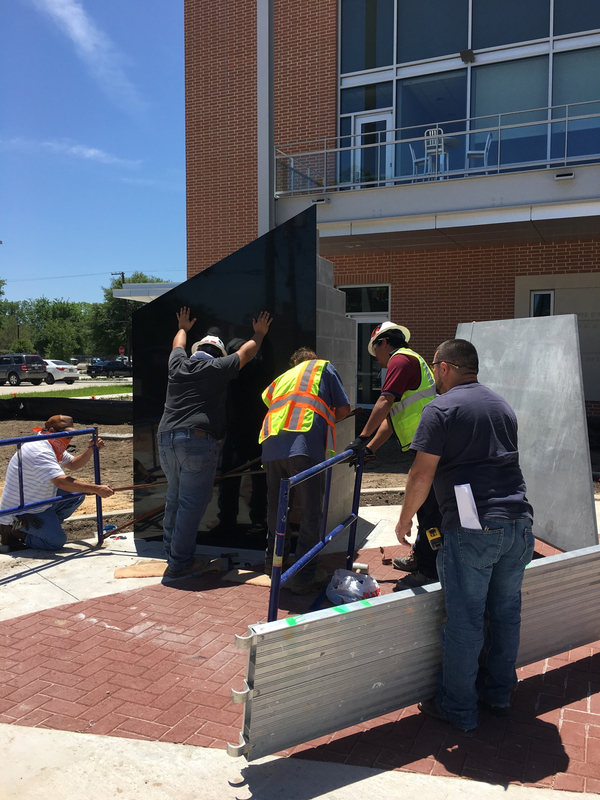 The Memorial was constructed in the spring 2017 and dedicated in tribute to Harris County’s fallen Peace Officers on May 10, 2017. 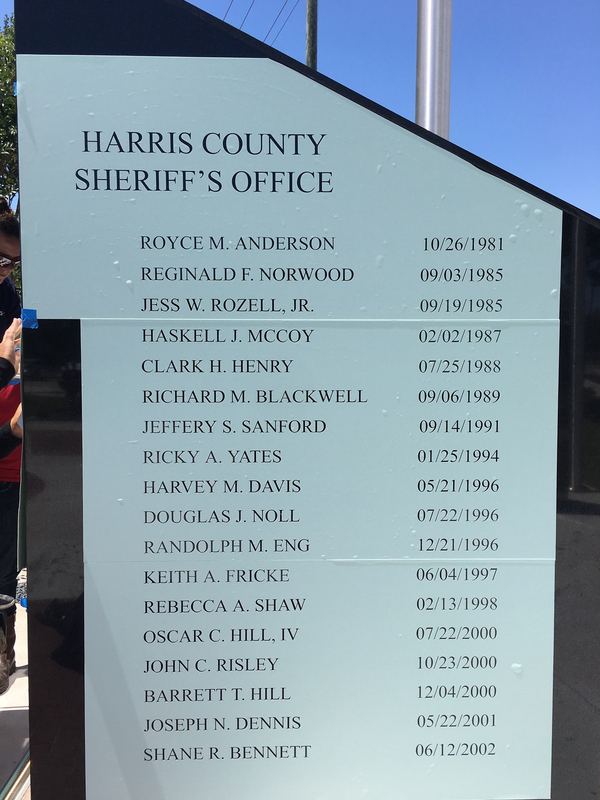 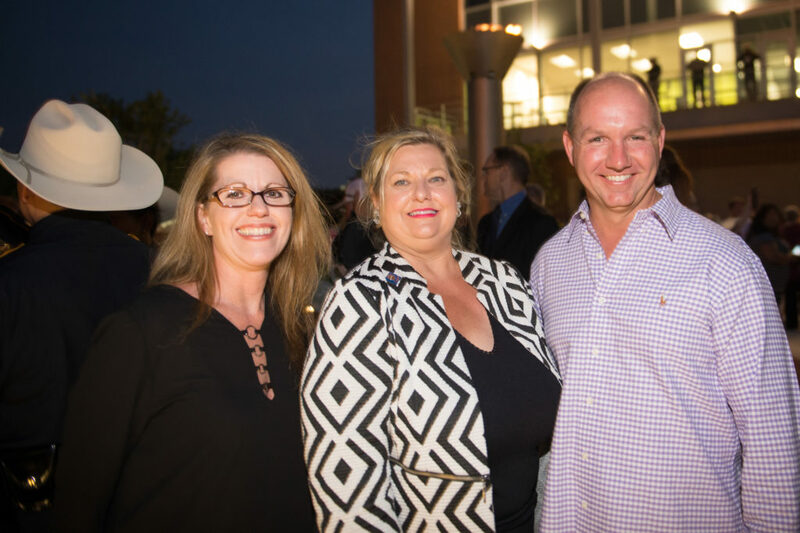 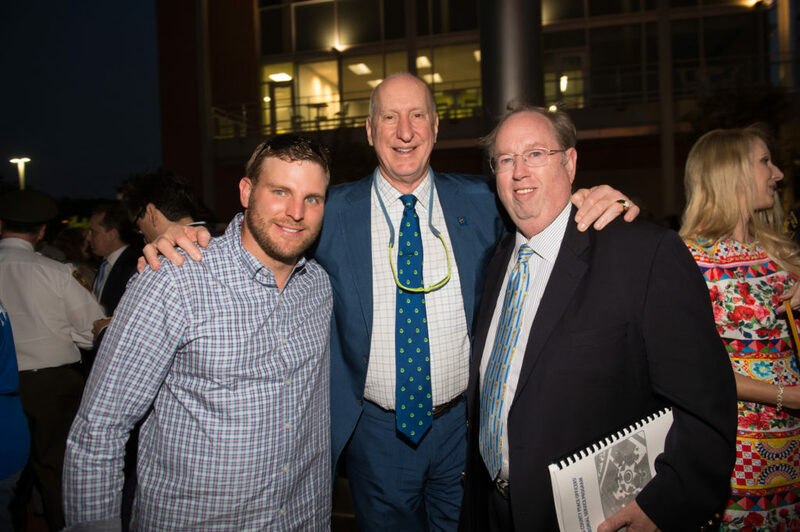 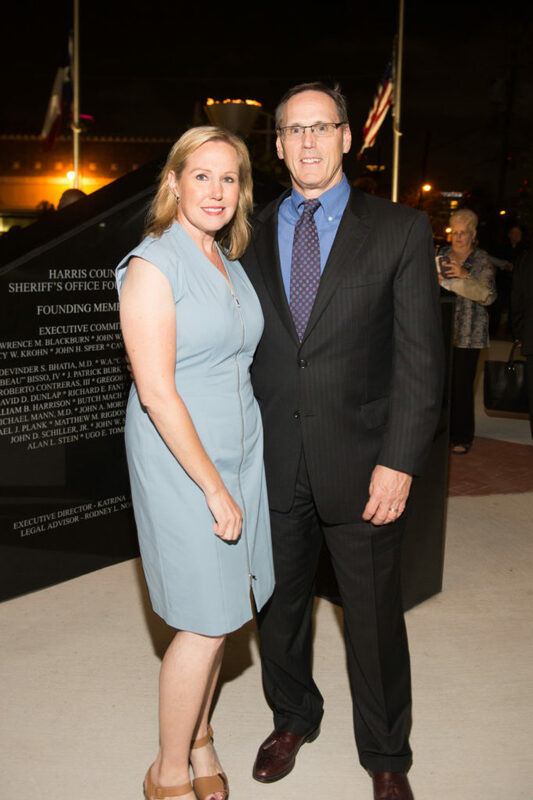 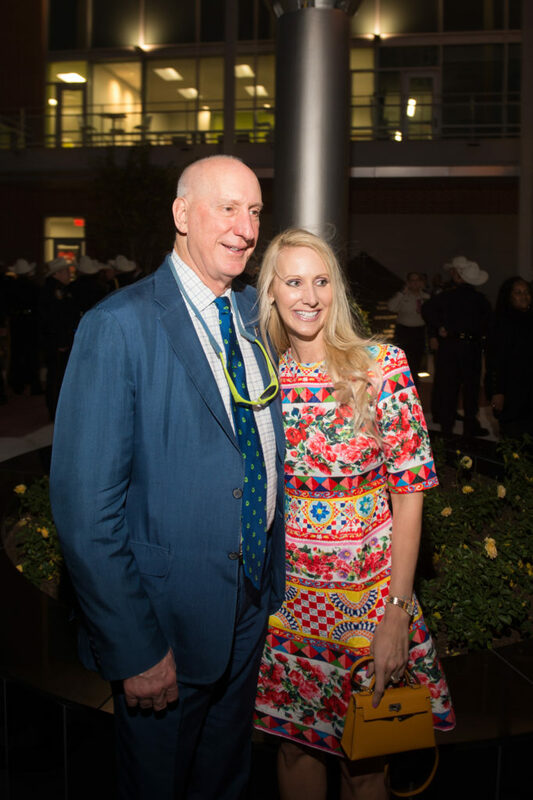 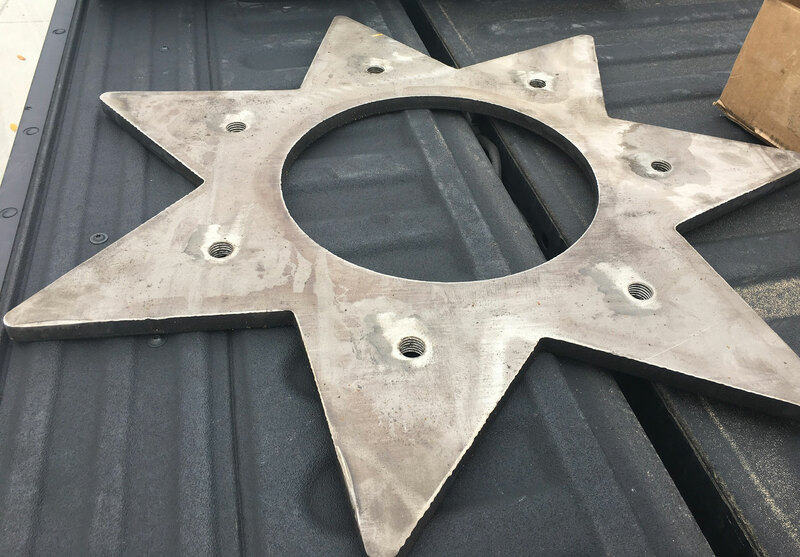 The design and construction of the of the Memorial was fully funded by the Founding Members of the HCSO Foundation and private donations to the Harris County Sheriff’s Office Foundation. 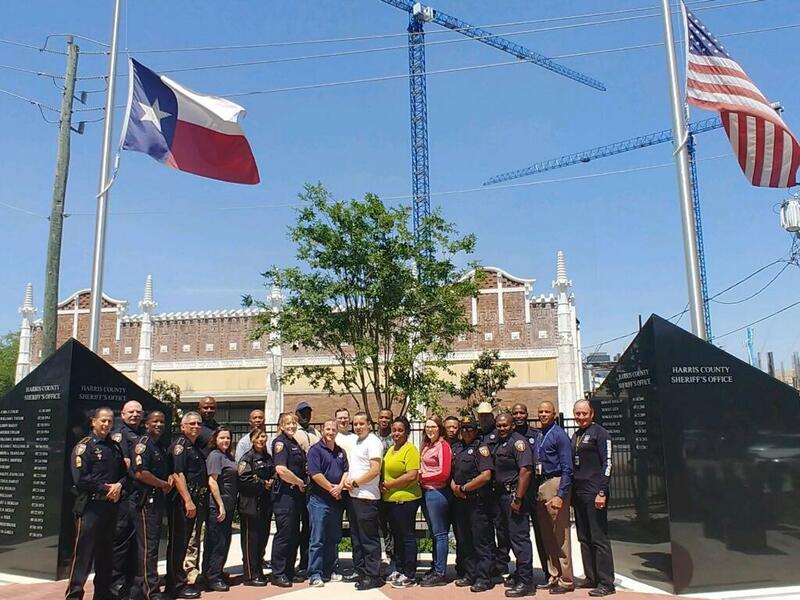 Additionally, the ongoing maintenance and operational costs are funded by the Harris County Sheriff’s Office Foundation. 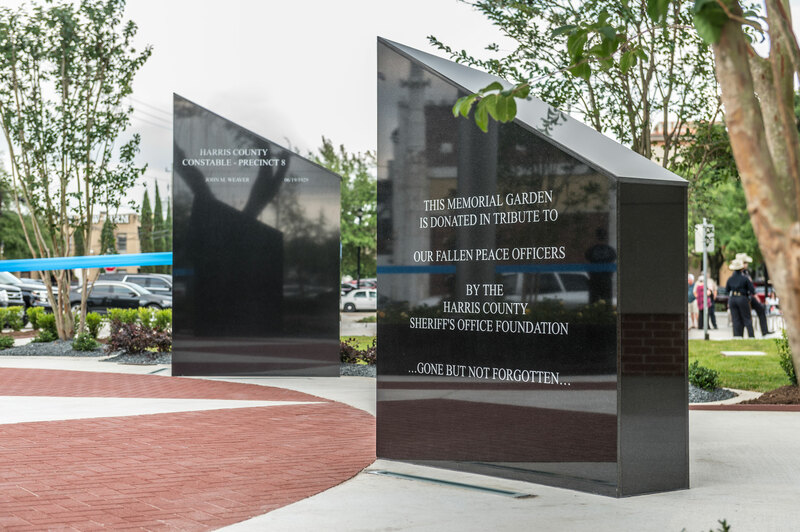 The HCSO Memorial Garden was designed to serve as a sacred place to respectfully give tribute to the memory and honor of our fallen deputies who have made the ultimate sacrifice of life. 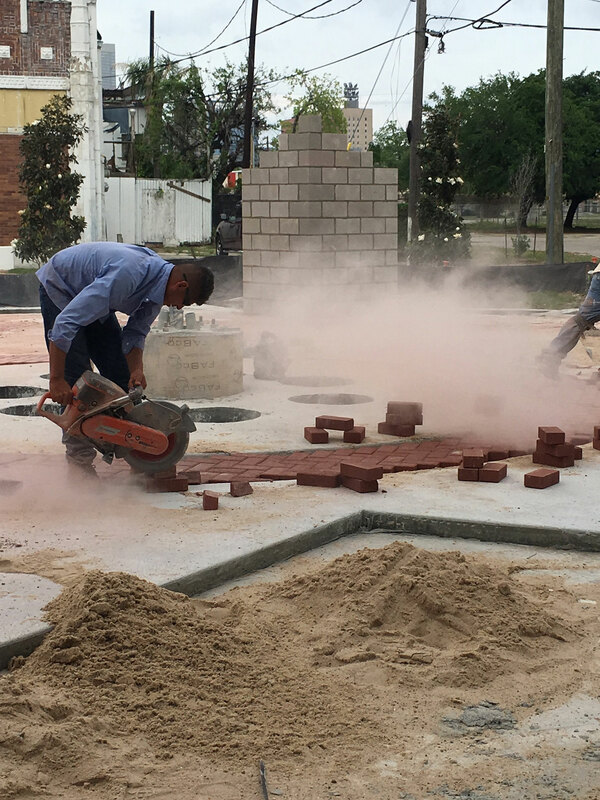 The hardscape of the memorial is constructed of pavers and concrete forming a Deputy’s badge. 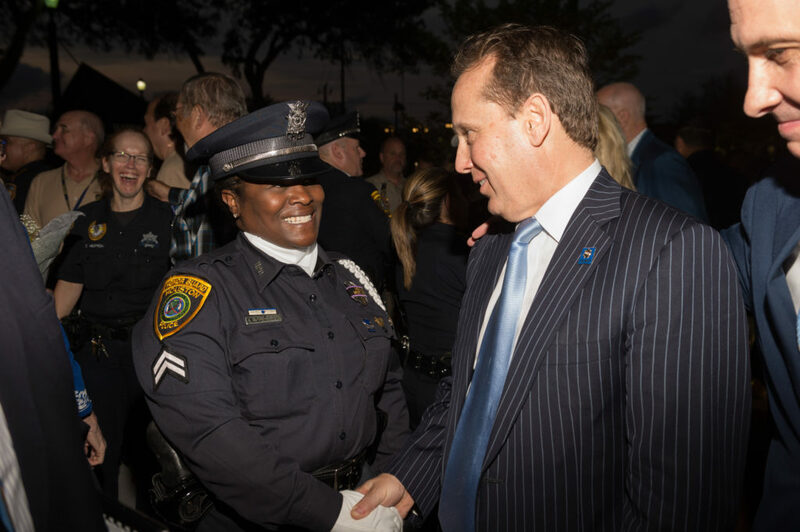 This badge is symbolic of the trust and confidence held by the community for protection by our deputies. 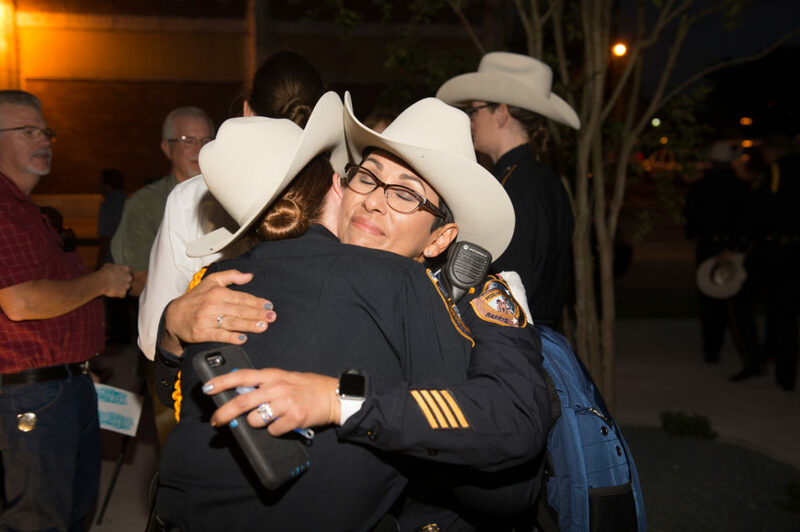 It also represents the importance of the sworn oath, duty and commitment by members of our law enforcement to serve and protect the community as public servants. 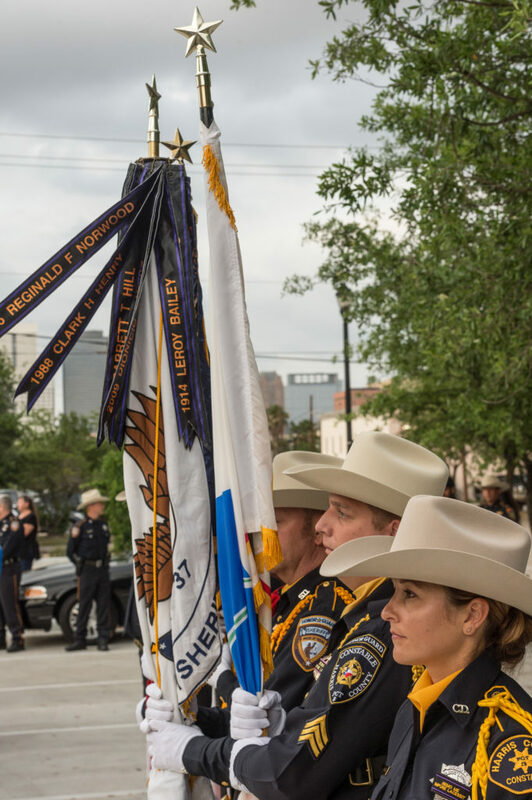 Seven granite towers surround the outer edge of the deputy’s badge. 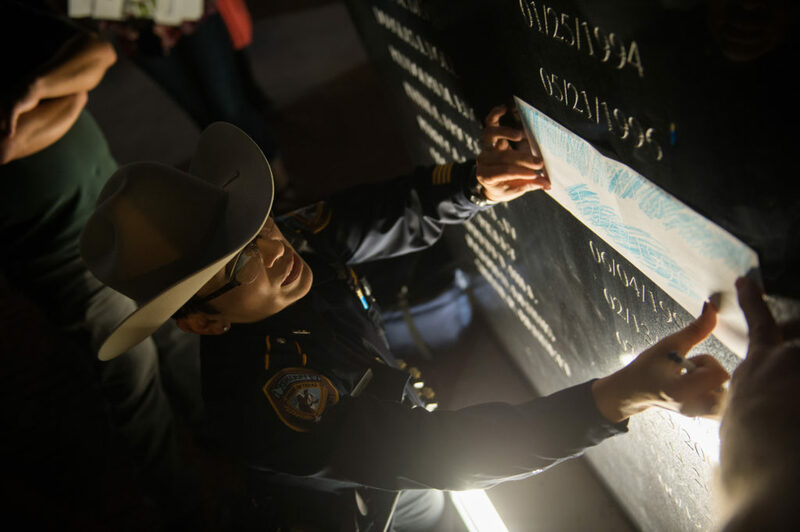 Each is constructed of polished absolute black granite, upon which each deputy’s name and end of watch date are forever engraved in stone. 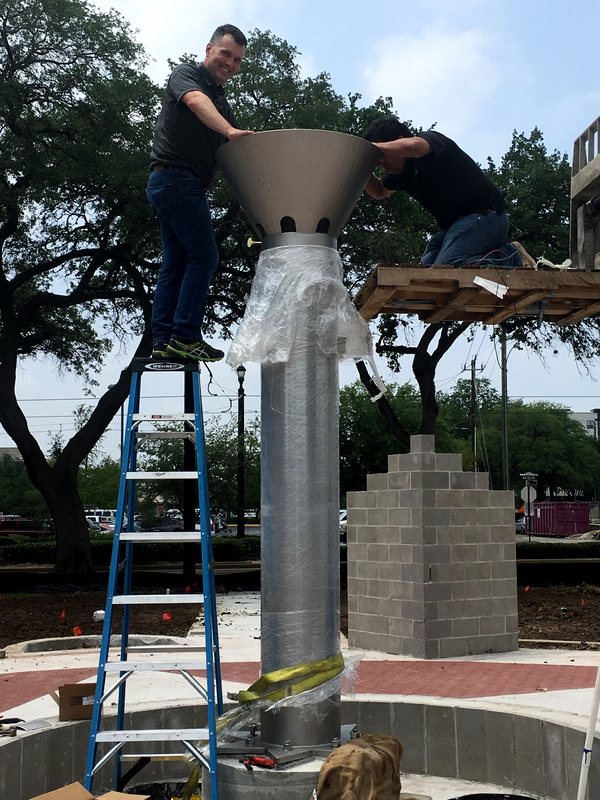 The Tribute Towers all face inward and upwards towards the “Honor Torch” which burns in the memory of each the fallen deputy. 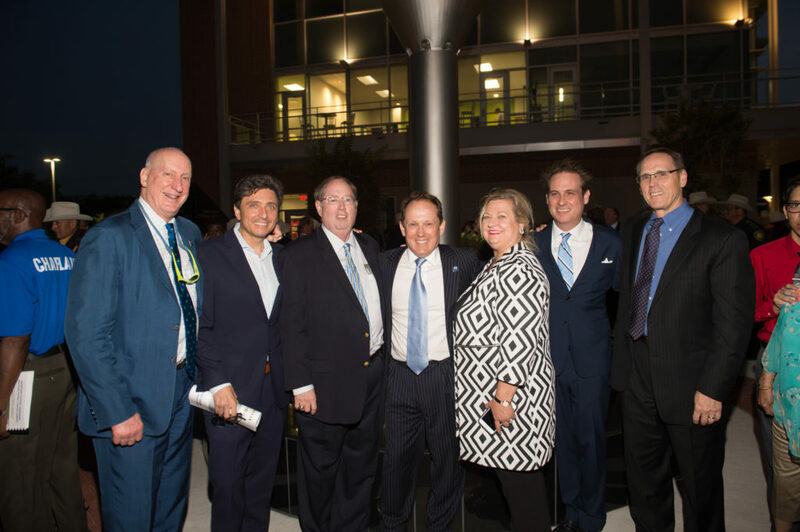 One tower stands lower than the others — the Dedication Tower. 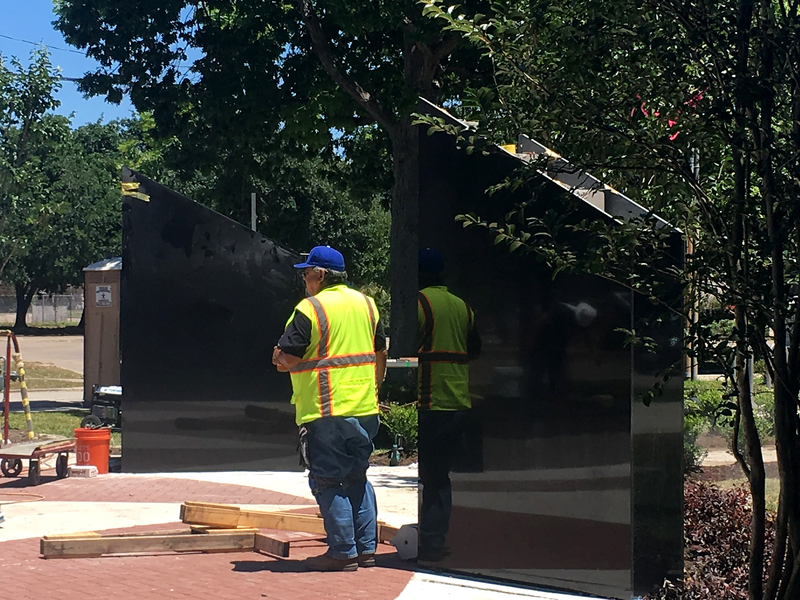 The polished finish of the black granite reflects light providing juxtapose mirrored images between the Tribute Towers and of the entire sacred space including the viewer. 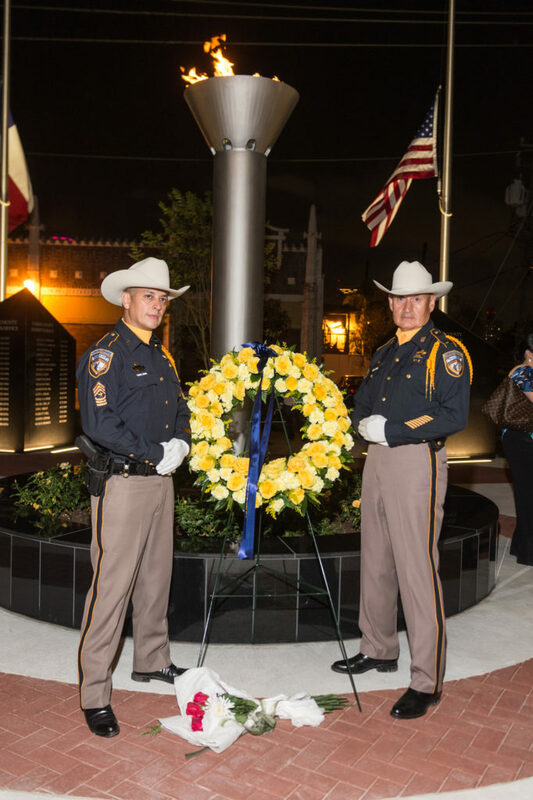 One can actually see and reflect upon the mirage of images including the deputy’s badge, the tribute towers engraved with the names of the fallen and the center of the memorial which is anchored by a fragrant yellow rose garden and Honor Torch. 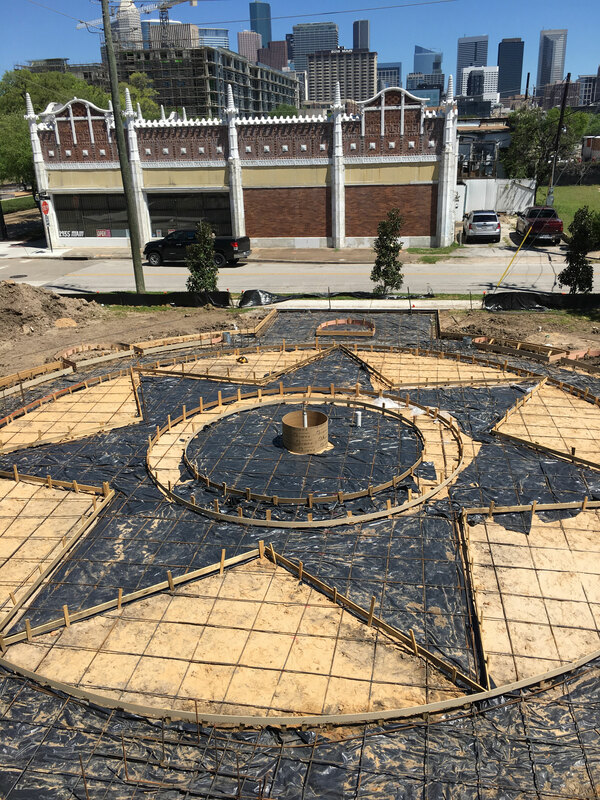 This inner-most circle and center of the Memorial Garden is formed by a black granite knee wall that surrounds the Honor Torch and rose garden. 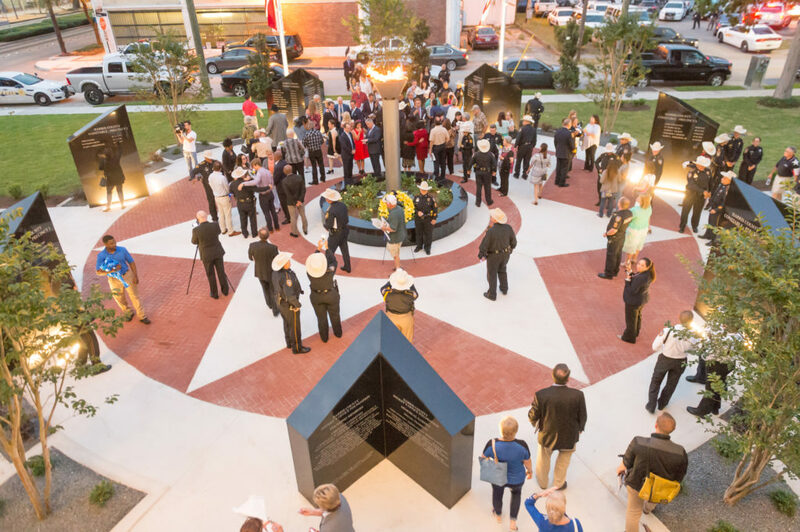 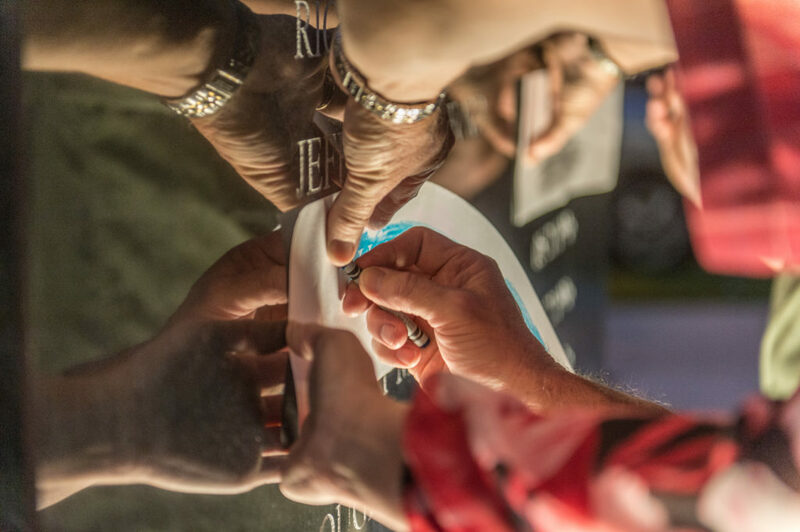 This inner circle symbolizes the on-going relationship and unity between the survivors of the fallen and members of the community who have joined together as stewards of the memory of each deputy’s ultimate sacrifice of life. 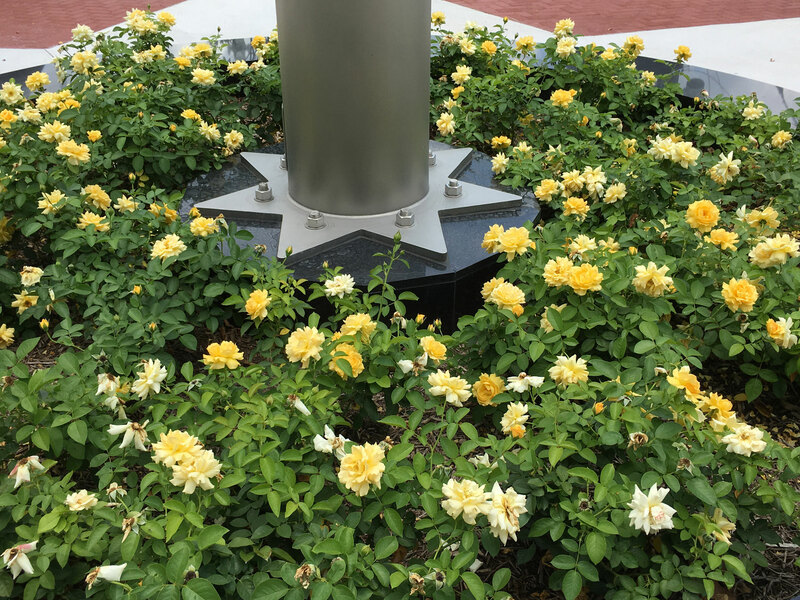 Planted within the center granite knee wall and directly under the Honor Torch is a yellow rose garden. 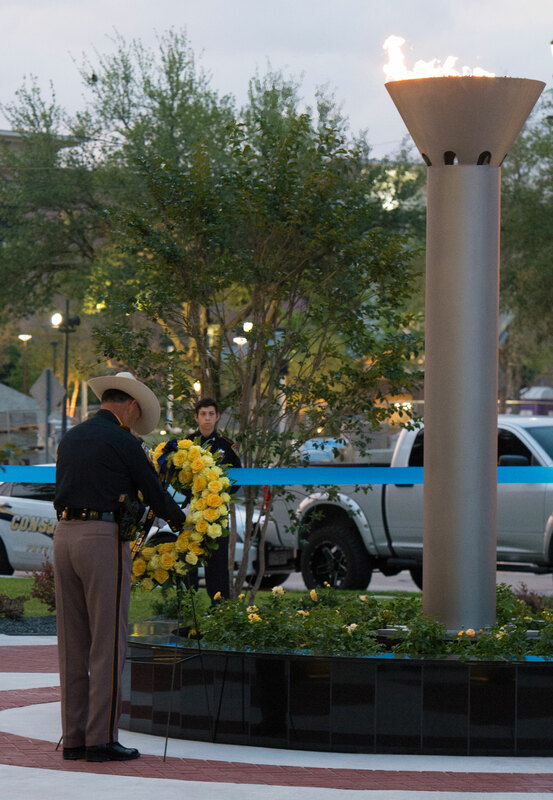 These roses are symbolic of the annual tradition of the HCSO Memorial Service held during police week each May. 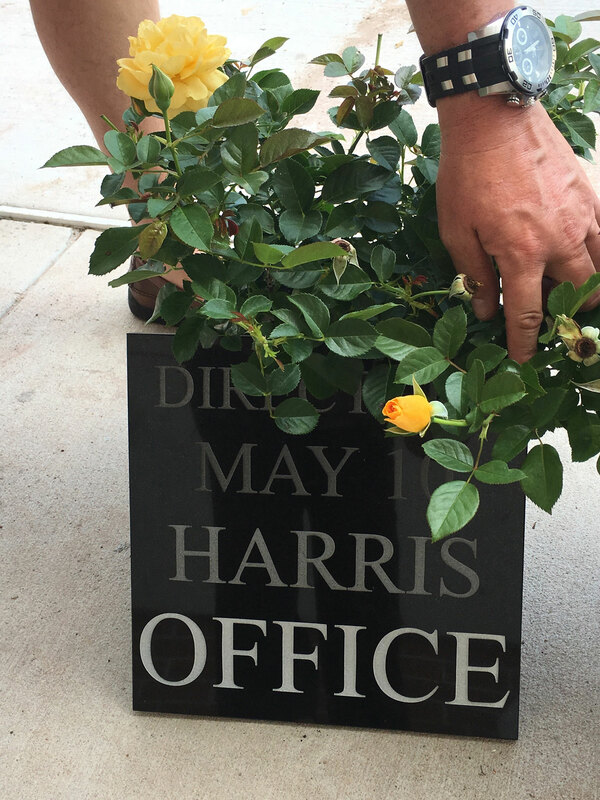 During the annual roll call of our fallen, a single long stemmed yellow rose is presented to each immediate surviving family member. 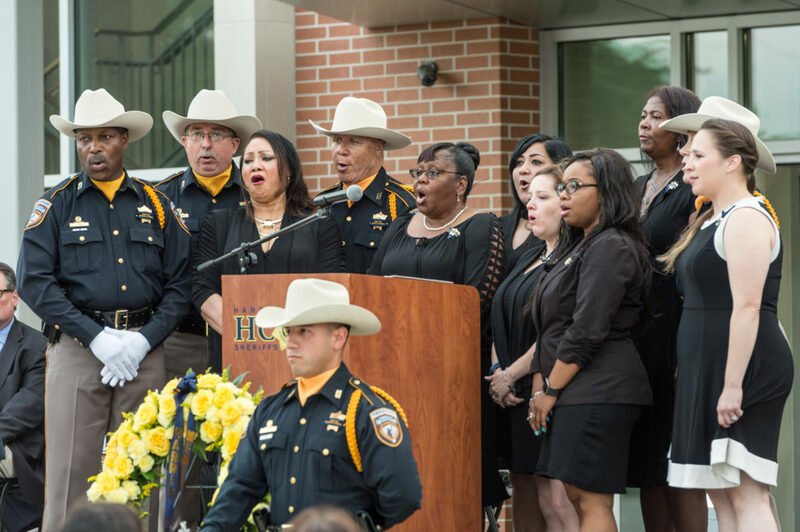 The presentation of a yellow rose serves to signify the ongoing appreciation by the citizens of Harris County for the fallen deputy’s sacrifice. 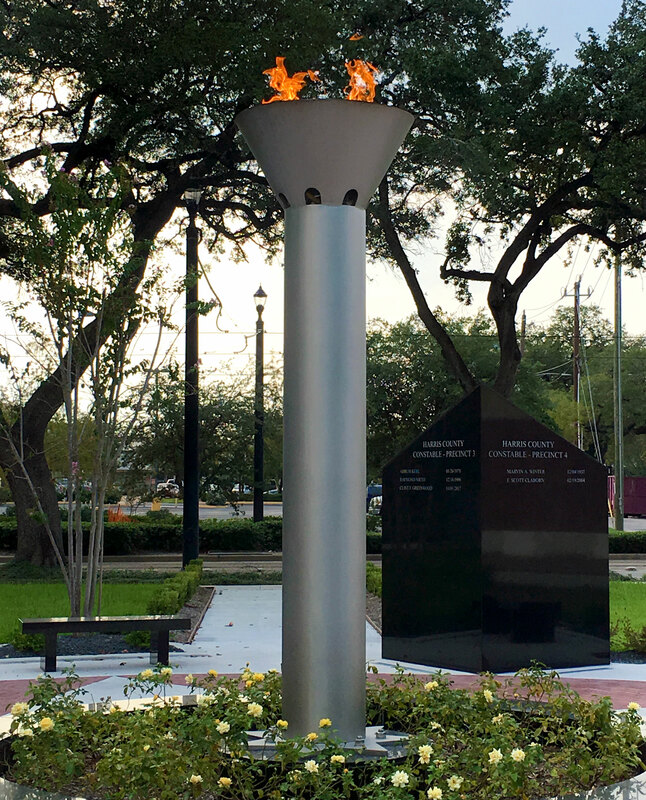 Constructed of brushed stainless steel and anchored at the base with a deputy’s badge, the stainless steel tower and burning flame basin form the Honor Torch. 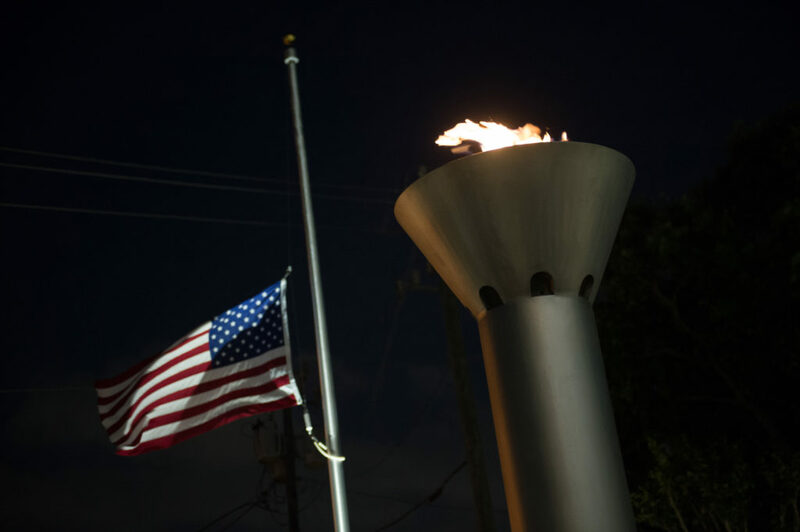 The Honor Torch signifies the continued memory and gratitude for the ultimate sacrifice of life by of our fallen Peace Officers. 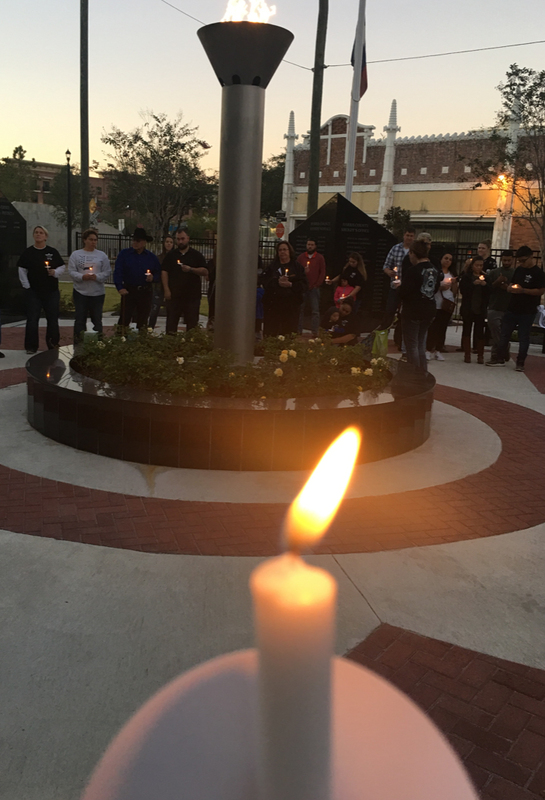 The Honor Torch flames burns on the anniversary of each deputies’ end of watch date as a continuing tribute and reminder that the while these officers are gone, they are not forgotten and we are eternally grateful. 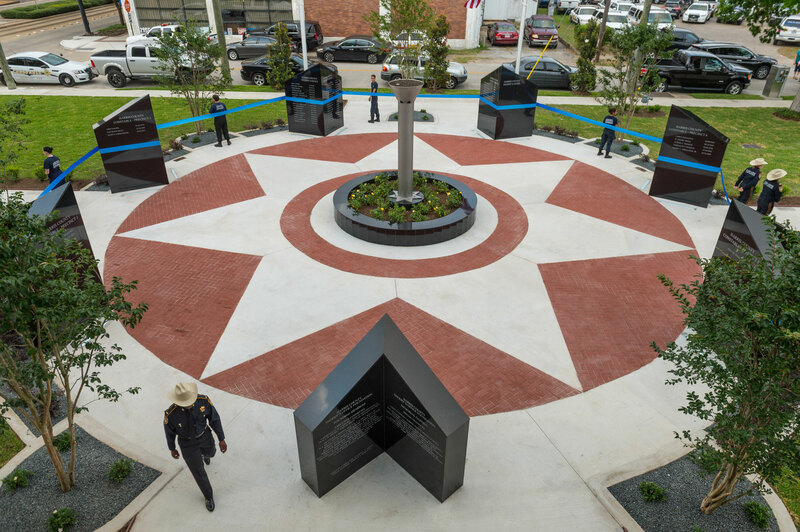 Four quadrants frame the Deputy’s Badge and form the outer boundary of the Memorial Garden. 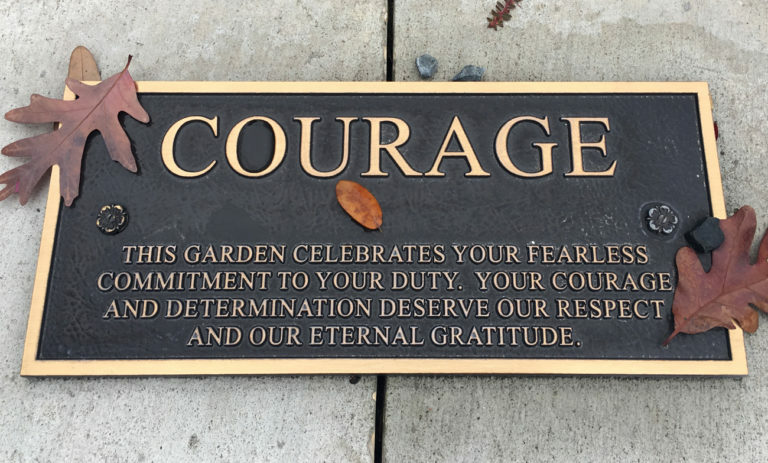 Each quadrant signifies an important core value essential to the important relationship between individuals within the community and our law enforcement professionals. 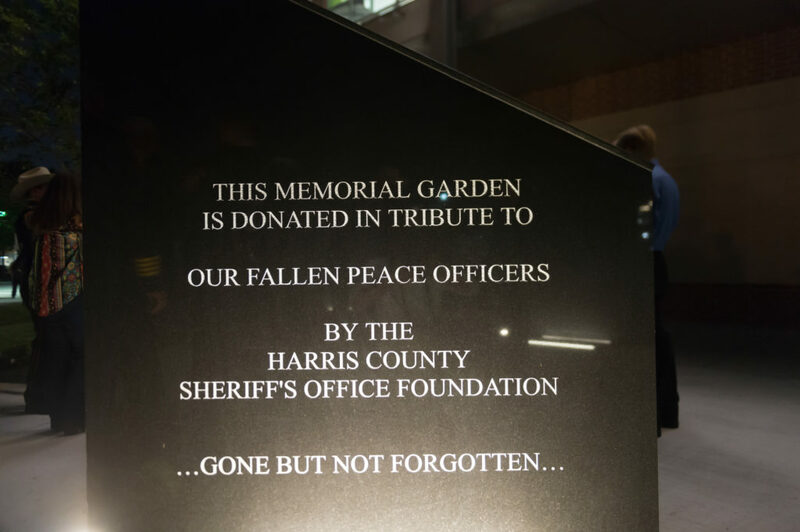 As a part of the annual HCSO Memorial Service that honors Harris County’s fallen Peace Officers, the Harris County Sheriff’s Office Foundation, (HCSOF) conducted the formal ribbon cutting ceremony and dedication of a Memorial Garden that honors Harris County Peace Officers who have made the ultimate sacrifice of life in the line of duty. 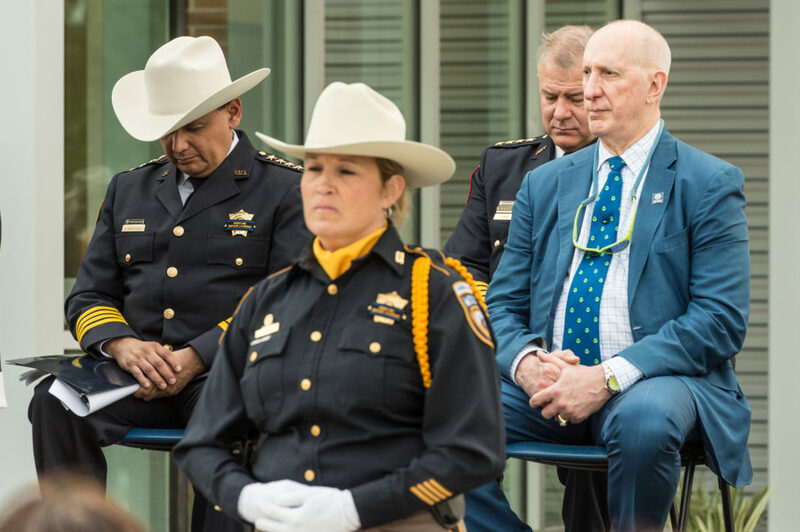 Present were HCSO Sheriff Ed Gonzales, former Sheriff Adrian Garcia, Founding Members of the HCSOF, local officials and law enforcement representatives, and surviving family members of the (61) fallen Peace Officers. 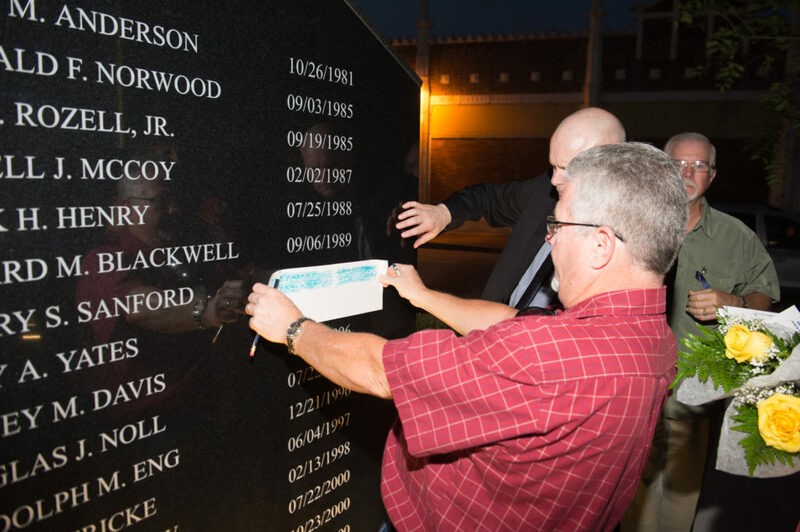 While they are gone, they are not forgotten. 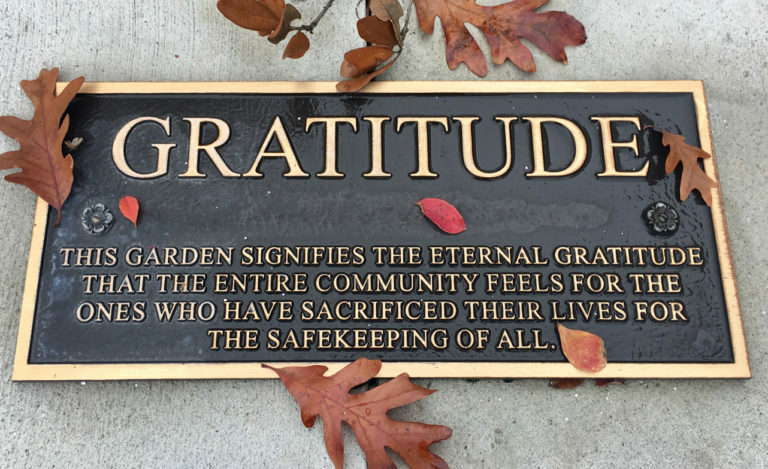 We are grateful for their ultimate sacrifice.